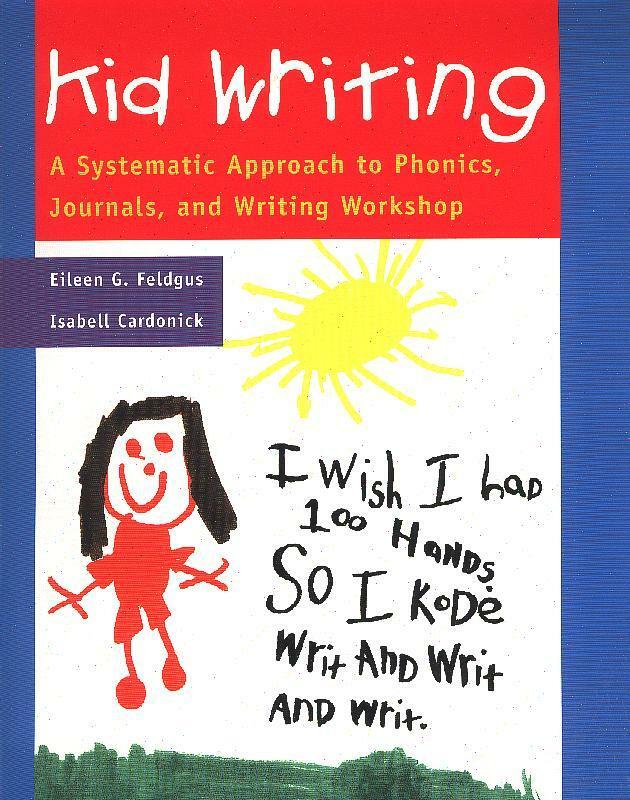 In Portsmouth we have gladly taken on the joy of Kid Writing created by Eileen G. Feldgus and Isabell Cardonick. Kid Writing presents a new vision for systematic phonics instruction and assessment. This is our second year of implementing this systematic approach, and the teachers are enjoying the process as much as the children are. Click here to view the Philosophy of Journal Writing which is the underlying basis for Kid Writing. I will attempt to share with you some of the ideas that are essential in Kid Writing, as we encompass them ourselves in the classroom. Spaghetti and Meatball spaces are very important in spacing between letters and words. 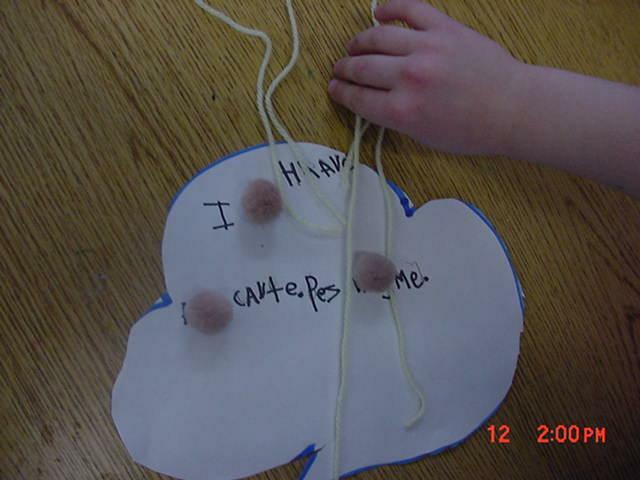 The children used yellow yarn and small brown pompoms in the beginning to help them visualize the spaces between letters in words and words in sentences. The children also have hats or Kid Writing crowns to help them with their writing. Click here to view Kid Writing Crowns. The process of learning to write by writing by Donald Graves is the underlying philosophy of the reading-writing process in our Kindergarten classrooms. Journal writing is an ongoing event as children decide on topics, illustrate it by drawing, and then use invented or phonetic spelling to describe the illustrations. The children are so proud when they "reread" what they have written. I have learned how to decipher their beginning efforts and you will too. The hope is that you as parents will reinforce through praise the child’s efforts. So often as parents you expect correct spelling and do not realize that spelling is developmental. In order to help you understand the process, here is an outline of the stages of developmental spelling. Formal assessment and rubrics will not be evaluated until March. When a writing, journal or book come home, I will assign a number in the upper right corner of the paper, indicating what level I believe the child to be writing at. Refer to this outline as a guide to your child's development in writing. 1. Precommunicative: Precommunicative spelling is used to describe writing that only conveys meaning for the child who wrote it. At this stage, the child conveys a message through scribbles, shapes, drawings, and/or letters that are strung together randomly and does not know that letters represent sounds. Examples: PRT = cake, RLFP = type. Examples: K= cake, t = type, MBEWWLNT = My baby was with me last night. 3. Phonetic: Phonetic spellers spell words the way they sound. They write all the sounds they hear in words. These spellings do not necessarily look like English spellings, but they are quite readable. Initial and final consonants are in place, and these spellers gradually add vowels, even though they may not be correct. Word spacing is evident. Examples: cak = cake, tip = type, caek = cake, It trd in to a brd = It turned into a bird. 4. Transitional: Transitional spellers begin to write words in more conventional ways. These spellers undergo a transition from reliance on sound to reliance on visual memory of how the word looks in print. They write with more correct vowels in every syllable. Often, all the letters necessary to spell the word are there, but some letters may be reversed. Examples: tipe = type, caek = cake, huose = house, opne = open. 5. Conventional: Conventional spellers develop over years of word study, reading, and writing. Their knowledge of the spelling system is firmly established. These spellers know when words don't look right, and they experiment with alternatives. They spell a large number of words automatically. Conventional spelling is a lifelong process.